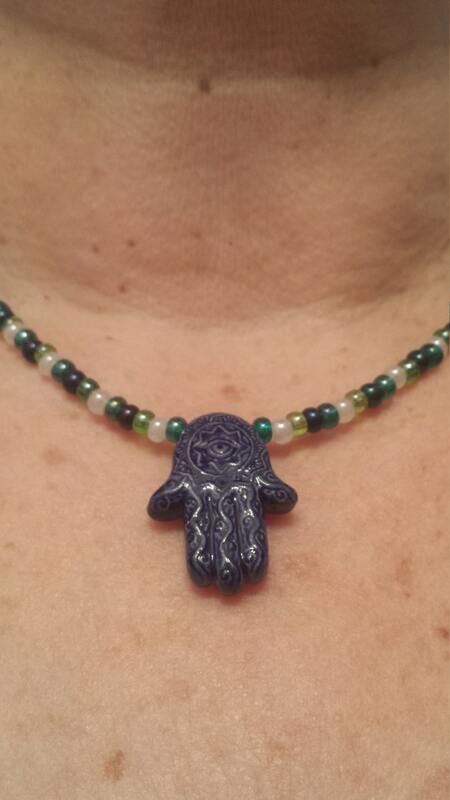 A beautiful navy blue ceramic Hand of God pendant surrounded by navy, green, and white glass beads. This symbol is used to keep the "evil eye" away from the wearer. You can wear it for that reason or just because you like the colors. The necklace is approximately 16" long with a silver lobster clasp in the back. From the picture, you can see that it hangs close to the neck. If you feel you need a longer necklace, contact me and we can work something out. The colors remind me of the sea and would look great with a crisp white blouse, a blue denim shirt, or anything you desire. When purchased, this necklace will be shipped in a padded envelope through the USPS. If you prefer any different type of shipping, please contact me.